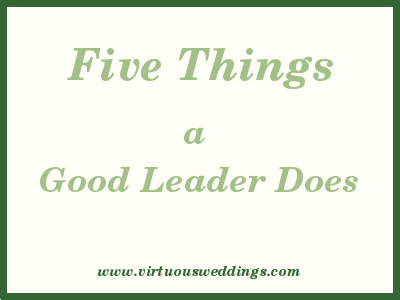 Dear Groom: A Few Thoughts On Your Approaching Promotion . . . There are many different kinds of leadership roles. Anybody can lead—no title, no authority required. But some leadership roles aren’t just about example and persuasion. They are intimately linked with rulership (that’s not supposed to be a scary word!). In other words, this leadership is not an activity, it’s a responsibility. These five points apply to a governing role (i.e. a Christian husband) even though they’re probably still applicable to other kinds of leadership too. Originally published in 2013. Bringing it forward for new eyes! He does what he expects others to do and holds the same standards for himself as for other people. He doesn’t only go there himself but he leads others there. He goes before them, making a way for them. He knows who and what he is, what he’s supposed to do, and why he’s here. As a result, his actions are consistent and effective. This may be the most important of all. It’s not all about you. Yes, you’re special. Yes, you’re important. Yes, you’re the head of the house. Yes, you’re the head of the wife. Yes, you’re in charge. Yes, you’re the boss. Yes, you’re supposed to be respected and obeyed (as well as loved and honored). But it’s not about you. If you thought it was, you missed your calling. You weren’t meant to be a husband or father . . . or Christian. Tweet: A good leader has a goal other than himself. Leadership in the family is not about fixing everything so that it pleases you and suits your tastes. It’s not about making sure everybody does what makes you happy. Where are you leading your family? If you’re the whole point, you’ve missed the whole point! Do you know how to lead a family?